Portable and convenient, the Fall Protection Roofing Kit 20058 complies with OSHA 29 CFR 1910.66 and 1926.502 regulations, and meets the requirements of ANSI Z359.1-2007 standards. 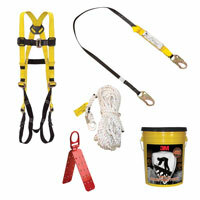 The kit contains a SafeLight universal harness, energy-absorbing lanyard, reusable roof anchor and a 50-foot rope lifeline assembly with a manual rope adjuster. A storage bucket with a lid is included. The FS60 LiftPod aerial work platform is ANSI A92.3-2006/CSA B354.1-04 compliant with the portability of a ladder and the stability of a work platform. The unit’s 30-inch base enables operators to move the LiftPod through doorways without having to take it apart. It is powered by an 18-volt drill or an optional power pack. The DBI-SALA Nano-Lok Self-Retracting Lifeline can be used in place of a lanyard and directly attached to any harness, reducing fall clearances. The automatic activating arrester locks quickly to stop falls within inches. Weighing only 1.6 pounds, these lifelines provide flexibility and are virtually unnoticeable to the wearer. They can protect workers weighing up to 420 pounds. 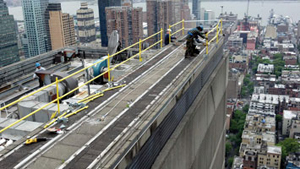 The Portable Telescoping Skid-Mounted Fall Protection System provides an inexpensive solution for areas that require temporary fall protection. It includes a 500-pound man-rated trolley with permanently sealed wheel bearings. 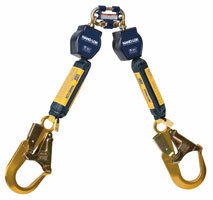 The system provides safe fall arrest performance with minimal deflection. It can be carried by a forklift to a new location in minutes (built-in forklift tubes included). The Turbo-Rail is a fast and simple solution for guarding leading-edge fall hazards on concrete slab construction jobs and roofs. No drilling is required. Simply clamp Turbo-Rail brackets onto a parapet wall or slab floor, insert vertical posts, and slide cross rails into place. Brackets are adjustable from 4-inch to 24-inch width. 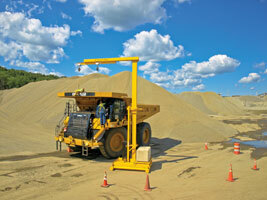 Systems are sold in either a 100-foot or 320-foot kit. 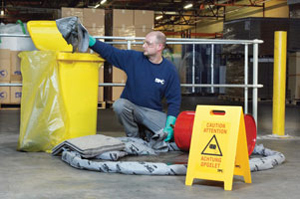 The GuardDog Industrial Safety Gate is tough, durable and easy to install. This ladder safety gate is self-closing and comes in five nominal sizes. It arrives fully assembled and includes securing hardware for standard installation on pipe. 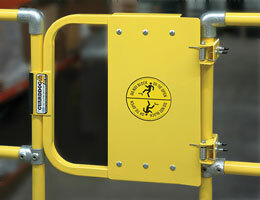 The GuardDog Safety Gate comes in three finishes: powder-coat safety yellow, hot-dip galvanized and 316 stainless steel. manufacturing transportation, the system is designed for workers weighing up to 400 pounds when used with 900 maximum arrest force energy-absorbing lanyards. No welding is required.